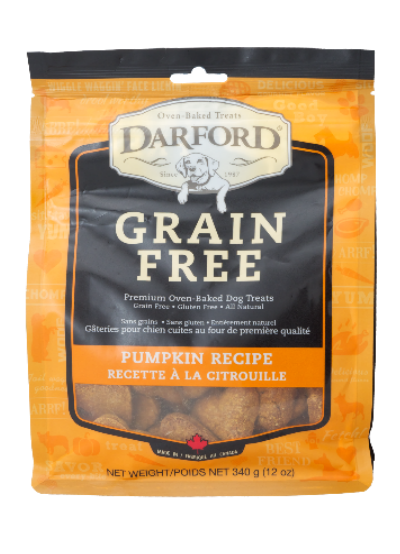 Darford Launches New Grain Free Treats! Darford is launching several new Grain Free treats this spring. Known for its high-quality, natural and healthy treats, Darford is pleased to introduce four new functional treats, three new flavors and a new Jumbo size, in the already popular Grain Free line. Hip & Joint, with turkey as the first ingredient, and Skin & Coat, with salmon as the first ingredient, will be available in the Mini size as well as the brand new Jumbo size. And, three new flavors in the Grain Free Minis are also being introduced – Bacon, Pumpkin and Peanut Butter. All seven SKUs are available in 19-pound bulk boxes. In addition to the treats, Darford will also be introducing new sealable bulk bags to compliment its bulk rack, making it easier for customers to choose Darford’s bulk treats. With more than 30 bulk flavors and sizes available, pet parents can choose a variety of their pooches’ favorite flavors. “We’re excited to be launching so many new skus this spring,” says Dave Caras, Darford’s SVP of Sales. “The new sizes and flavors are what many of our customers have been asking for; Grain Free Pumpkin, Bacon and Peanut Butter have been extremely popular flavors; and the new functional treats will help pet parents provide their dogs with that extra measure of care.” Caras says customers can expect to see the new skus in retail outlets later this spring. Darford’s Grain Free treats are gluten free and contain all natural ingredients. The flavor represents the first ingredient in the treats, making them a healthy addition to any dog’s diet. And they come in three sizes, just right for every size of dog. Darford is known for its natural, healthy treats. In operation since 1987, Darford bakes all of its own treats in its own facilities, which are located in both the U.S. and Canada. Carefully sourced ingredients, with no meat by-products, no preservatives, no added salt, corn or soy, and no ingredients from China means the highest quality treats for your best four-legged friend.